There are many circumstances that require your pet to stay with us in the hospital. Treatment and the regulation of certain medications are a few examples. When they are here with us they are closely monitored. 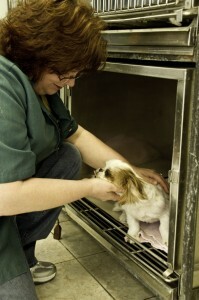 Pets needing frequent attention are kept right in the treatment room cages where they are constantly in sight. Pets that may have a contagious disease are kept separated in our isolation area, and visited frequently. We make every effort to minimize the stress of your pet’s stay with us — for them and you! We provide plenty of TLC to them, and stay in frequent contact with you, keeping you up to date on their progress.